Each applicator swab is packaged individually in a sterile peel-away pouch. Sold per pack of 100 or in cases of 1,000 (10 packs). Flocked Swabs use a unique application process of charged nylon fibers to create a brush-like swab with no internal area in which to trap specimen sample. Entire sample is released into liquid media. Cells are easily collected between the fibers, with no entrapment due to loops of wound Dacron or nylon. Flocked Swabs result in better sample collection and improved patient comfort. 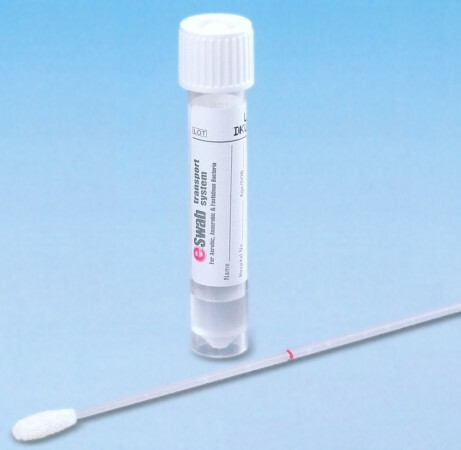 Scored breakpoint allows the swab to easily fit within the media tube after collection. All Flocked Swabs utilize a nylon tip and plastic applicator, and all are sterile and individually wrapped. These easy-to-use specimen collection systems are designed to support a wide range of bacteria. Tube contains a soft polyurethane foam sponge which is soaked with 1.0 mL of transport medium and acts as a moisture reservoir. When swab is inserted into the tube, the sponge yields and compresses, and liquid medium is immediately drawn into the soft rayon swab tip. Individually wrapped. Universal Transport Medium for transporting virus, chlamydia, mycoplasma and ureaplasma. Formulation includes antibiotics to inhibit bacterial and fungal flora in patient samples. Safe, shatterproof polypropylene skirted tube stands upright on the lab bench. Available with flocked swabs or in bulk packs of tubes without swabs. This multipurpose transport platform supports aerobic, anaerobic and fastidious bacteria for up to 48 hours at room and refrigerator temperatures. ESwab includes 1 mL of Modified Liquid Amies and a flocked swab. Simply collect sample, insert swab tip into Amies solution, break swab shaft at scored breakpoint, and attach cap with swab inside tube. ESwab is available with three swab types. The Rovers® Orcellex® Brush is a new and innovative instrument that allows for easy collection of cells from the oral epithelium. The collected cell material can be used for diagnostic and research applications as LBC and post PCR applications. The shape and the dimensions of the new Rovers® Orcellex® brush make it possible to sample intra-epithelial locations where most dysplastic cells are found. The resulting samples are composed of cells that are representative of all layers of the oral epithelium (basal and parabasal cells, intermediate cells and superficial cells). Laboratory tests have shown a high adequacy rate and high cellularity of the samples. The Rovers® Orcellex® Brush is a non-invasive instrument; it has proven to be well accepted by patients and is easy to use. 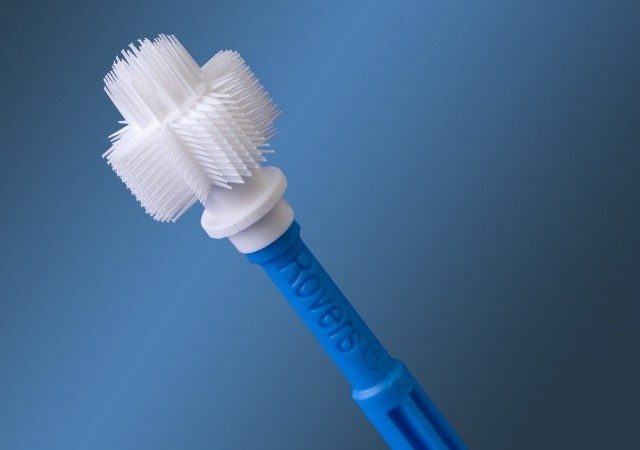 It has been shown that the Rovers® Orcellex® Brush combined with the LBC technology can provide good samples that can be used either for diagnostic or research applications. The DNA extracted from the Rovers® Orcellex® Brush kits was of a satisfactory quality for post PCR applications used by the UK National Genetics Reference laboratory for the diagnosis of genetic diseases, such as Cystic Fibrosis family screening. It offers a new non-invasive method of DNA collection. The technology is simple to use and provides good quality DNA. 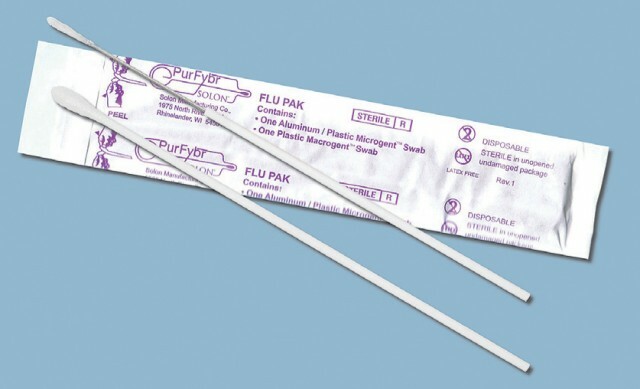 The Flu Pak(TM) includes two diagnostic swabs, a specialized nasopharyngeal plastic/wire handle swab with a polyester tip that is scored for ease of testing, and a scored polyester throat swab. Save time and money, and ensure the best results for your patients by having both swabs convenient in one sterile package. Clinical studies have shown that taking cultures from both the nasal cavity and throat yield a higher test accuracy.